Is it me are these days just flying by. Holly it's the end of September already. It's Sunday Scrappin time again. Being there was no Sunday Scrappin post last week due the host having a family emergency (and I'm glad to say that she has reported her daughter is doing well), so I am going to combine the cards I made from the last 2 weeks in this post (hope you don't mind). I recently came across another meme called Camera Critters so be sure to check out my other blog (http://theworldthroughchrissyslens.blogspot.com/) for those post. That meme is all about pictures of various animals and those to know me this is perfect for all the dog pics I have of my Buddy! That's really it I don't have to many ideas in my head I'm fried from all the overtime and aggravation I've been dealing with at work the last few weeks. This weeks Sunday Scrappin challenge is to make something with paperclips. I have some cute dog bone paperclips and other various shapes, hmmm.... what can I make. I can do a dog page. 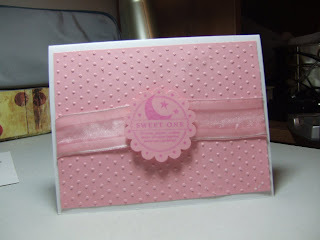 I made this card for my sweet friend forgetfulone, she celebrated her birthday earlier this week. She mentioned on her blog that her birthday was coming up and I emailed her to ask when and she responded with the date and the comment that it's just another day, after a certain age they don't really count anymore. That's where the card saying "I know you don't give a hoot about your birthday.....But I do. Happy Birthday". 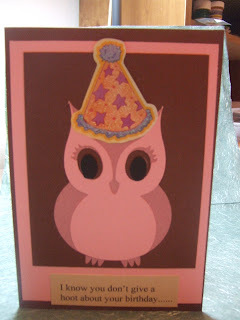 The owl was cut on on the cricut using the Dreams Come True cartridge and the party hat is a sticker from my collection. Ever get a card idea in your head and you really have no purpose for the card other then you just want to make it? Well this is one of those cards. The idea popped in my head a few weeks back out of the blue and I finally got around to making it. 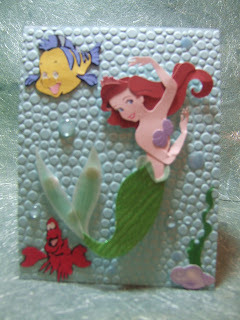 My original plan was cut the Little Mermaid out on the cricut using my Dreams Come True Disney princess cartridge. All was well into it was time to cut the eyes. I only have the baby bug and those eyes are so damn tiny. So then I thought I would cut her out again onto white cardstock and then color them in, NO they looked scary. I tried and tried no luck only frustration. Then I remembered that I had a mermaid Jolee I could use. The Flounder and Sebastian are from the cricut cartridge. 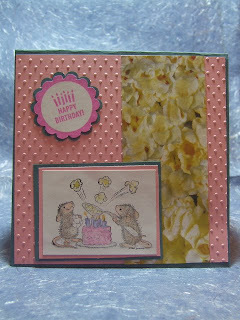 The background is cuttlebuged using the tiny bubbles embossing folder. In the picture on the Little Mermaids fins you can see the pop dots but in real life you can't really see them on the card, but I had the card under the light and it was showing through more. Does that make sense? My sister's best friend Carrie is in the hosptial having surgery so last night my sister came over and we made get well cards for Carrie, I don't have a picture of my sister's card the batteries died in the camera. Carrie likes whales so I used the Get Whale Soon stamp from SU Pun Fun stamp set. 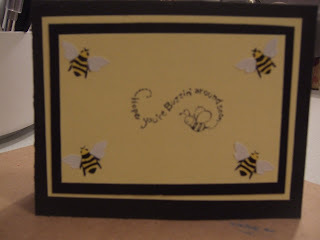 The background is embossed with the cuttlebug tiny bubbles embossing folder. I added the green to the card to give it a cheeriness so it wasn't so blue looking and feeling. It's hard to tell in the picture but the image is pop dotted to give it a little character. 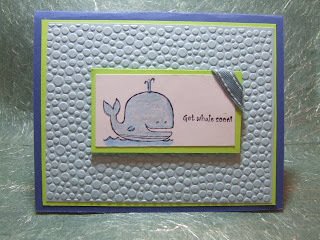 I love to emboss with the cuttlebug pop dot and I almost used stickles on the whale but decided not to. I love the sketches over at Taylors Cupcake Challenges, a new sketch is posted every Friday (even though it's called a Cupcake Challenge you do not have to use Cupcakes, it's just she's a big cupcake fan). I am happy to say that all the paper used on this card is from my scrap pile. I have so many scraps it's unreal, and it's so much easier to go to the paper rack to pull out a full sheet of paper instead of sorting through the paper box. Last night I went to Walmart and got a 5 drawer tote I have 2 -3 colors in a drawer and then I just separated them by a piece of cardboard then all the pattern paper is in one drawer. It's a start and it's already made a difference. I still have some scraps to sort and put in their new home but I wanted to play. 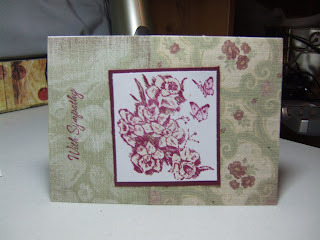 I love my cuttlebug machine for embossing. 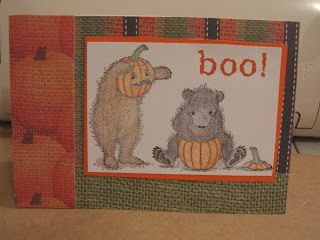 The background was embossed using the swiss dots embossing folder. Thanks for looking. Hoping the weekend goes super sssss-lllll-ooooo-wwwww, I return turn to work on Monday (my vacation is almost over). The last baby card I made (can be seen here) was okay but I wasn't thrilled with it so I decided not to send it to my friend. I am pleased with the way this card turned out today. The image is from an image swap I did a few months back. I cut the image out using the couzzle circle cutter, I had that thing for years but finally really starting to get use out of it. The scallop circle was cut out using the Cricut Storybook Cartridge. The strip along the center of the card is cuttlebug embossing borders folder called Frills, the hearts are buttons from my stash. 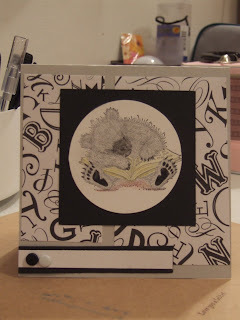 The layout of the card is this weeks sketch challenge at PaperTake . The pattern paper I had for a long time it is by Frances meyer and is called Buttoned Up Patchwork. Of course I had to put stickles on the card, the center of the flowers and the butterfly are stickled, hey what's a girl could without glitter? I recently came across a new blog called Wild DragonFly Designs . She is offering an awesome lot of Halloween Blog Candy. 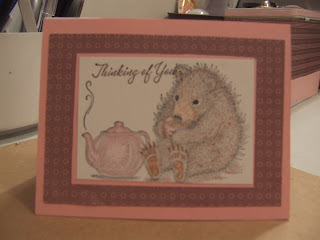 While your there be sure to check out some of her creative cards she's made. I love her designs, they are different. While at the Big E we came across a stamp booth called Sarasota Stamp Co from FL. When we first approached the booth I bought 2 small stamps (m&m and a paw print and a bottle of stickles) because I had my heart set on the House of Mouse Booth (I received an email stating they will be at the fair). We left the Sarasota stamp booth to hunt for the House Mouse booth, which we finally found and what a big disappointment for me. They had NO stamps at their booth just cards, calenders, magnets etc. with their images on them. So we went back to the other Stamp booth and I bought 6 more bottles of stickles, 13 bottles of embossing powders, and this cute snowman stamp. 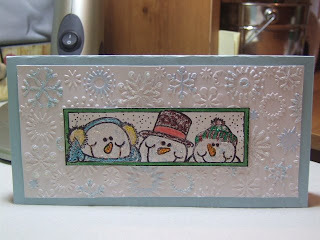 On to the card: The snowmen are colored in with stickles and the background is the Cuttlebug embossing folder Snowflakes and some of the snowflakes are stickled too and some I went over with a colored pencil and colored in. The stickle colors used are: icicle, baby blue, yellow, xmas red, turquoise, green, orange peel, and burgundy. I just wish the stamp co. had online ordering but they don't but I have her email (wink wink). I love the fact that it doesn't really take that long for the stickles to dry. Be sure to check out my other blog here for some pictures taken at the Big E Fair and other misc. pictures. So hard to believe that Christmas is right around the corner. It's time to start thinking about Christmas card designs. I'm going to put together a list of all the people I need to send cards to so I have an idea of how many I need to make. I think I'm going to make something (not sure yet) with a list of the people that I send cards to and their addresses so that it's already done for me next year and I can skip the list part. 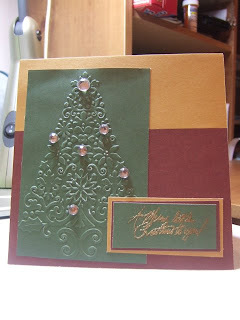 I used the cuttlebug Lace Tree Embossing Folder. It took me some time to figure out what to do with it being it is so detailed an elegant on it's own. But when I saw the sketch challenge at OCC I knew I had to use this folder. I am excited I finally got the hang of embossing (with a heat gun and powder)!! All the paper is from Colorbok Traditional Christmas paper pack (had it for a long time). The saying is from SU Merry Little Christmas stamp set and is embossed in gold. I love when there are sketch challenges and as soon as I look at the sketch I have an instant card idea, I love when that happens!! 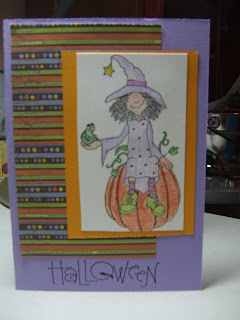 This sketch is this weeks challenge at I(heart)2Stamp. The challenge was to use the sketch and bella's well I don't have any bella's. When I saw the sketch I knew I wanted to make a girly card. The Images are from SU Totally Cool and Haute Couture sets. The pattern paper is from DCWV Everyday paper packet. 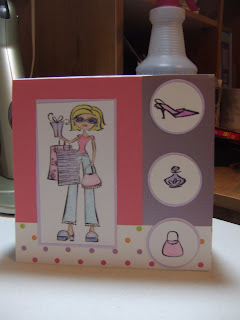 I can either use this card for my sister who is becoming more and more of a girly girly each day (age 13) or a girlfriend at work who is a big time shopper and girly girl, but here birthday isn't until April. For the inside of the cards, I leave it blank until I go to use the card this way I can put in the apporiate saying for the occasion. I tried to get this post combined with my other post but some reason it didn't take. This is another one of those cards I made that are okay I'm not overly found of it. I think I'm going to make another baby card. My friend's daughter is having a baby and wanted to make her a card being she is due in a few weeks. But I'm sure if I really like this one. So hard to believe it's that time of year to start thinking about Christmas cards. 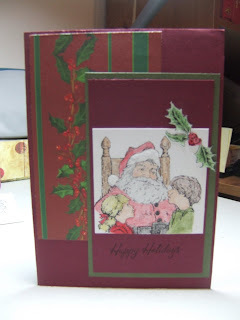 For this card I used the SU Merry Little Christmas Stamp set. I'm not sure if this is the card I'm going to make for this year's Christmas cards. I have a few other Christmas card ideas I want to play with and see. It's hard to tell but I put white fun flock on the fur part of hat's hat and on the ball of his hat. I had the image of the witch for a long time. I received her from one of my very first image swaps that I did years ago. The pattern paper is from my stash from last year. The saying on the bottom is a stamp that I got last year at Michael's in the dollar bin. After I made the above Christmas card I got this card idea using the same layout pretty much. I'm getting a late start today to my Sunday Scrappin post. First before we get started I want ALL dog owners to go read this blog and please make sure you do not have this dog toy in your home. 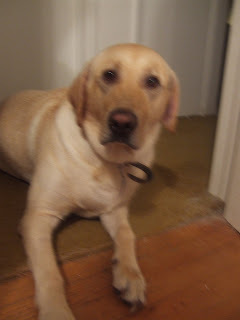 http://thechaistory.blogspot.com/2008/08/chai-story.html PLEASE BE ADVISE THIS IS EXTREMELY SAD AND HEART WRENCHING!!!! Back to the books card - this was a card idea I had "floating in my head since I received the image. Halloween Card - I used an unopened embellishment on this card the boo Rubin I bought last year at an after Halloween clearance sale. My to do list this week will be lite being that I will be working overtime this week and next week I'm on vacation!!!! This week's Sunday Scrappin Challenge is use something from the kitchen. It could be tin foil as an embellishment... a food label to decorate a page... Kool Aid to make a scratch and sniff ... use your imagination! I'm defiantly going to have to pull my imagination out for this one. Hmmm.....I'll have to think on this one. 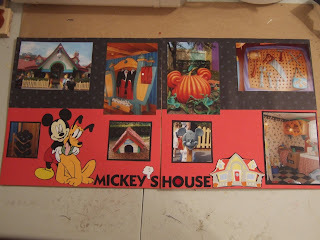 For this Layout I wanted to stick to the same style that I used on the Minnie's House Layout (can be seen here) The title Mickey's House was done on the computer using the Mickey font printed onto white cardstock then cut out, then I went over it with a black marker. 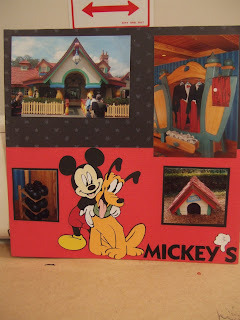 The mickey/pluto figure and the house were cut out on the cricut using the Mickey & Friends cartridge. 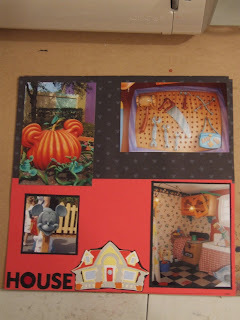 This page is part of my 2006 Disney Trip album. I still have aways to go before this album is done. My goal is to get the 2006 album done before our next trip which hopefully (fingers crossed) will be next year or the year after for sure. Fall is my favorite time of year, I love all the colors and the kids in their cute and scary costumes. The image on this card came from the WishRak group. I am loving the gruffies images, they are from the creators of House Mouse images. The paper is from a paper pack from the dollar store, I picked it up last year. The word boo is a rub on that I picked up for a a quarter or less last year after Halloween. I can also use this for this week's Sunday Scrappin challenge to use an embellishment from your stash that has never been opened (the rubons been in my stash almost a year and just seeing daylight, they were buried in the Fall embellishment drawer). The layout of the card is this weeks SCS Sketch Challenge 192. I'm thrilled with the way this card turned out. I was able to combine three challenges into one in this card, that in it's self is always exciting it doesn't happen often though. The layout of the card is from Taylored Expressions Cupcake Challenge #31 (as you can tell cupcakes are not a requirement of the sketch). I left the oval saying off from my card because it wasn't looking right, I couldn't decide if I liked it with it or without it, so I left it off. 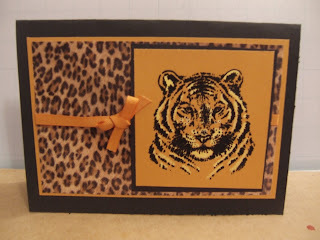 This weeks challenge at Stamps, scraps, n more is to use bleach on your creation. This is such a fun and easy technique. I love the look. The Tigers face is bleached. The tutorial on how to do this can be found here. The Challenge this week over at Sunday Scrappin was to use an embellishment or something that you have your stash for awhile that has never been opened/used. I received a RAK (random act of kindness) last Christmas from an online friend of black embossing powder so I used that I my tiger to emboss him. I tried heat embossing once a long time ago but it didn't work out but come to find out I used the wrong ink pad so I think I will be investing in more embossing powder colors but no how does this mean my cuttlebug is being put to rest. Has soon as I saw this image it said school time, finals etc to me. For the layout I used this weeks I(heart)2Stamp sketch I left the strip along the bottom empty because I'm trying to think of a saying to put in there. I'm thinking that this card can be used more towards the middle/end of the school year when my sister is bogged down with finals and test. Any idea for a saying?? I thought the paper from DCWV everyday paper pack was perfect because the letters are all over the place, which makes me think that is just what is in that poor little bears dreams. I cut the circle out with my couzzle circle template. The image is from Wishrak. Thinking of you Challenge - only embellishment can use is ribbon. 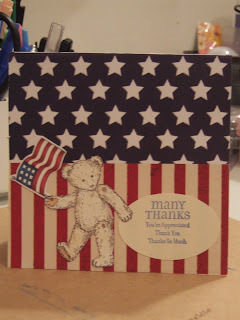 This card is being sent to a solider in a combat hospital that is recovering from their injuries. 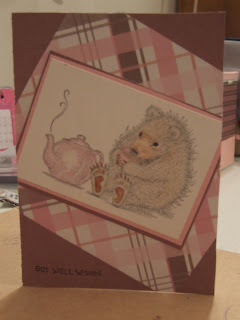 Get Well Challenge - This card is being sent to a solider in a combat hospital to help cheer them up. The bees in the corners are stickers that I had forever and the image in the middle is from SU Farm Fever stamp set. 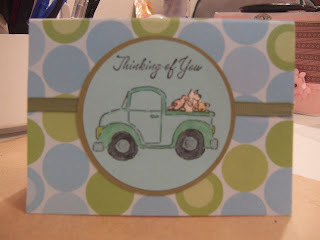 Thinking of you - I made this card originally to send to a solider in a combat hospital but it is very girlie and the cards need to be non-gender specific. But I can't help myself for some reason this stamp yells Girlie and Pink to me (see card below) I made another card with this image and I used pink and browns again without thinking. Only think different besides the color scheme so I could send it to the troops would be I would move the verse thinking of you over more to the left. The image I received from WishRak. It's such an honor to make these cards for our troops overseas to send back home to their love ones and to the troops in the combat hospitals.